Premier Boxing Champions presented its second major welterweight matchup in 2017, again at the growing boxing venue the Barclays Center in Brooklyn,NY. 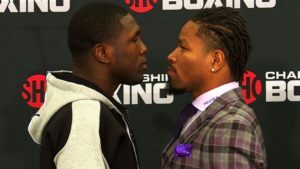 Andre Berto and Shawn Porter are both former welterweight world champions, with the winner getting a chance to take on the unified welterweight champ, Keith Thurman. The leadup fight is between two Jr. Midleweights from the great state of Texas. Jermell Charlo, one half of the famous “Charlo Twins”, will defend his WBC title for the first time, against a very game Charles Hatley. Hatley has only fought outside of his home state of Texas once in his career, when he went to Australia and beat an aging Anthony Mundine over 17 months ago. Hatley came out a bit more wild in the opening round. It was easy to see who was the champion, with Charlo landing the much more effective, crisp punches. Hatley was the more aggressive fighter, as Charlo was content in countering and waiting on a heavy shot. Charlo recieved a cut over his left eye due to an accidental clash of heads in the second round. In the third round Charlo landed a beautiful three punch combination to knock down Hatley. Hatley was definitley hurt, but was able to survive the round by moving and holding appropriately. Charlo is able to land a one, two, left, right to the head of Hatley at will. Charlo cuts off the ring with no problem and can even fight backing up and using his supperior speed to counter Hatley. In the fifth round Hatley just decided to continualy move around and around the ring, not engaging with Charlo. Charlo was able to use a stinging left jab that snapped Hatley’s head back every time. Charlo decided to unleash a barrage of punches in the sixth round and ultimately ended the fight by knocking Hatley out of the ring with a devastating right hand to the chin. Charlo defended his title and proved that he was on another level than Charles Hatley. Neither of these veterans decided to come out and feel the other out, it was a rough and tough battle from the first bell. Both Berto and Porter fought and clinched, wrestling around to show the other who was the stronger or more dominant man. Berto was just physically dominated by Porter in the second round. Porter bum rushed his way in, got Berto on the ropes and used his head, elbows and just unloaded punches. In the trenches, Porter ended up coming away with a nasty cut over his left eye, from a headbutt. This didn’t bother Porter in the slightest, as he put Berto to the canvas at the end of the round with a right hand to Berto’s temple. Porter just puts his head down and bumrushes Berto into the ropes. Porter is mentally frustrated by not being able to box and continually fighting with his back against the ropes. The recklesness of Porters sytle is he ended up getting cuts over both of his eyes from headbutts. The ugliness of the fight now has both fighters with bad cuts over their eyes. Porter is an overwhelming swarm of a fighter, pushing forward , with no regard to headclashes or shots landed back. Berto, is having trouble with the blood flowing into his eye. Porter is fighing thinking the fight could end at any moment and go to the scorecards, Berto is trying to figure out a way to get back to his gameplan. In the seventh round, Berto has been landing his counter shots much more accurately. Those punches come very few and far between unfortunately, as Porter has the advantage of power and continues to lead with his jab and braun. Porter came out in the eighth round and used Berto like a heavybag. Porter immediately got Berto on the ropes and just unloaded against the body and head. Berto didn’t seem to be hurt, but he was never able to get anything started at all. Porter, who seemed to have an endless supply of energy, rushed Berto and in an ugly exchange between the two fighters, Porter was able to knock Berto down for the second time of the fight. Berto complained about a clash of heads that left him seemingly dazed. Porter rushed in again, got Berto stuck in a corner and the ref stepped in and stopped the fight in the 9th round. On Saturday night in Brooklyn, New York Showtime will televise at least two bouts in the welterweight and junior middleweight divisions live from the Barclays Center in Brooklyn, New York. The main event will be between two top contenders, Shawn “Showtime” Porter and Andre Berto in a WBC Welterweight Title eliminator. The co-main event will be for the WBC Junior Middleweight Title between Jermell Charlo and Charles Hatley. Other boxers on the undercard include WBO Women’s Bantamweight champion Amanda Serrano, Jose Miguel Borrego, Julian Sosa, and Richardson Hitchins. The following is a preview of the Porter vs. Berto and Charlo vs. Hatley bouts. This bout is between two boxers who should be somewhat familiar with each other, Jermell Charlo and Charles Hatley. Charlo and Hatley are both Texas natives and Charlo hails from Houston while Hatley hails from Dallas. Charlo, the younger twin brother of Jermall, will be five years younger than Hatley and will have about a one inch height and reach advantage. Hatley, however, appears to be the harder puncher of the two. Hatley has stopped eighteen of his opponents and four of his past five wins have come by TKO. Charlo has only stopped thirteen of his opponents and only two of his past five opponents were stopped. Both boxers have not been very active recently. Charlo only fought once in 2016 and twice in 2015, while Hatley did not fight in all of 2016 and fought twice in 2015. They both had decent amateur careers, but Hatley was the more accomplished amateur. Hatley was the 2007 US National Amateur Welterweight Champion and the 2008 Olympic alternate. Charlo won the bronze medal in the 2005 Junior Olympics. Charlo has the better resume as a professional. He has beaten the likes of John Jackson, Joachim Alcine, Vanes Martirosyan, Mario Lozano, Charles Bellamy, Gabriel Rosado, Demetrius Hopkins, and Harry Joe Yorgey. Hatley has beaten the likes of Emmanuel Augustus, Anthony Mundine, Saul Roman, and Jose Flores. His lone loss was to Lanardo Tyner, and he failed to go the distance in that bout. At the age of thirty one and not having fought in over a year, ring rust is a serious concern for Hatley. Charlo is coming off a very good win against Jackson and momentum and age is on his side. This should be a close bout early, but Charlo should take over in the later rounds. This is a bout between two of the top contenders in the welterweight division that are looking for another chance at a welterweight title shot. Another loss for either boxer could spell the end of any hope of fighting for a title in the near future. Both Porter and Berto had successful amateur careers. Porter was a World Golden Gloves Champion and came up short in qualifying for the 2008 US Olympic Team. Berto was a National Golden Gloves Champion, a bronze medalist in the 2003 World Championships, and represented Haiti in the 2004 Summer Olympics. Both boxers have had some difficulties as of late. Berto has gone 3-3 in his last six bouts while Porter has gone 4-2. Porter has losses to the likes of Keith Thurman and Kell Brook by close decisions. Berto has lost to the likes of Floyd Mayweather Jr., Robert Guerrero, Victor Ortiz, and Jesus Soto Karass. Berto appears to have the harder punch of the two. He has stopped twenty four of his opponents while Porter has only stopped sixteen. However, Porter is five years younger than Berto and will have a half an inch height advantage and about an inch reach advantage. Neither boxer has been very active the past two years. They both fought once in 2016 and twice in 2015. Berto’s career started off strong but has since fizzled a little bit. He has wins over Victor Ortiz, Josesito Lopez, Jan Zaveck, Carlos Quintana, Juan Urango, Luis Collazo and Freddy Hernandez. 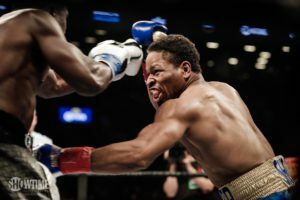 Porter’s two losses could have gone either way, and he has defeated the likes of Adrien Broner, Paulie Malignaggi, Devon Alexander, Julio Diaz, Phil Lo Greco, and Alfonso Gomez. This should be a good bout and as typical for most Shawn Porter fights, will likely be very rough and chippy. Porter should be given the edge based on his edge and recent performance, but Berto has the power to stop the fight early if he lands a punch cleanly. This writer believes Porter will win a close, and at times ugly, decision.